A hardened-gloss revision of the School of sharks built with an abundance of new raw materials harvested from the Fungal Cavern. A mighty Mineral body, infused with Gemstones and diamondine teeth. A shark-shaped machine built to maul the toughest of mice! The inclusion of infra-red, gem-based spotlights for eyes makes it even tougher to hide once the trap is sprung! The Gemstone Shark Skin can be used on the School of Sharks weapon. The trap's stats (power, power bonus, attraction bonus, etc.) are not changed. The Gemstone Shark Skin can be purchased at the Fungal Cavern Trapsmith for 800,000 gold, 500 Minerals, 70 Gemstones, 10 Diamonds, and 12 Crystal Crucibles. It can be refunded at the same location for 144,000 gold. The Gemstone Shark Skin can be traded on the Marketplace. 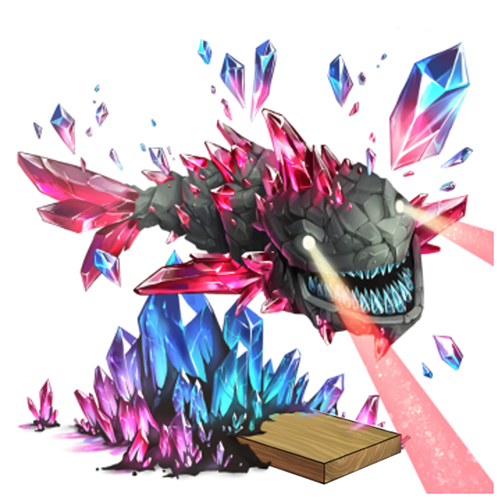 12 May 2015: The Gemstone Shark Skin was released with the introduction of the Fungal Cavern. This page was last edited on 11 January 2018, at 13:13.